Your job site is remote, you need to move quickly as an opportunity for a project has been presented. You need cool office space with hookups to run all your office equipment, phone and internet to reach employees and suppliers. What structure can accommodate your needs? A mobile container office structure or portable building can be a possible solution to this business challenge. 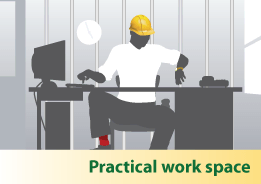 Mobility, security and stability are paramount in any offsite work space. The use of a shipping container as a base structure begins to fill the beginning requirements. These containers are built with 16 gauge steel and do not require foundation at their location. The base shipping container or conex box is the perfect structure to add container modifications to the interior. These modifications come together as a structural solution for employee works pace with storage if needed. They are movable and even connectable. The structure in combination with secure doors and windows creates a secure work environment for employees, documents and equipment. It is important to consider the following features when creating your next mobile container office work site. Entry and Ventilation are important to include with personnel doors for access and windows for natural light and ventilation. Temperature Control is important in many climates and this can be created with the correct insulation and HVAC units. Business operations will run smoothly with electrical wiring for phone, lighting and internet. The consideration of a repurposed shipping container for your next mobile job site while taking into consideration the list of features above may lead you to your first shipping container conversion projects as your next business solution. If you're thinking about a shipping container office, give us a call at 877-704-0177.